Fried Mutton Chops is a recipe that came to me from my aunt-in-law who is an excellent cook. While the traditional way is to deep fry the chops, I have made it healthier by using the AirFryer. Mutton chops, two a piece, with a layer of spiced potatoes and breadcrumbs, fried evenly to make them crisp from outside makes this a perfect snack for the holiday season, or a perfect meal in itself with some salad on the side to balance. If you do not have an AirFryer, deep fry the chops and they will taste just as good. If you have some cooked mutton mince at home, roll the chops in mutton mince before the potato layer to enhance the taste. Ask your butcher to give two ribs to a cut, that will be a double mutton chop. It ensures more meat per chop, especially if the goat is a small one. A meat chop is a cut of meat cut perpendicularly to the spine, and usually containing a rib or riblet part of a vertebra and served as an individual portion. The most common kinds of meat chops are pork and lamb. A thin boneless chop, or one with only the rib bone, may be called a cutlet, though the difference is not always clear. Boil the mutton chops with crushed garlic, grated ginger a pinch of turmeric and some salt in a pressure pan for about 30 minutes. Allow the pressure to drop on its own and remove the chops and keep aside. Discard the water. Preheat the airfryer. While the AirFryer is getting heated, beat the eggs with a pinch of red chilli power and salt. Mash the boiled potatoes and season them with generous amount of red chilli powder (suit your taste, but spicy tastes good), salt and garam masala. Dip each double chop in beaten egg, apply an even layer of potatoes over it and roll it over the breadcrumbs. Keep aside. Make two chops at a time, baste them with oil and a bit of egg wash and arrange them in the preheated AirFryer tray. Allow them to get AirFryed for about 7-8 minutes, and keep basting the chops every 4 mins or so for good results. 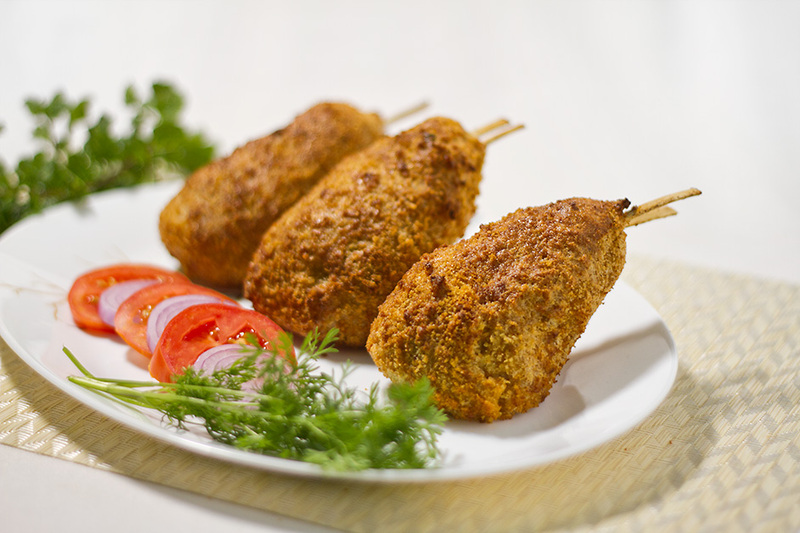 Serve the double mutton chops hot with some salad on the side, or with coriander chutney. Gosh, anytime is a good time for this mutton chops. I am lovingly loving them.